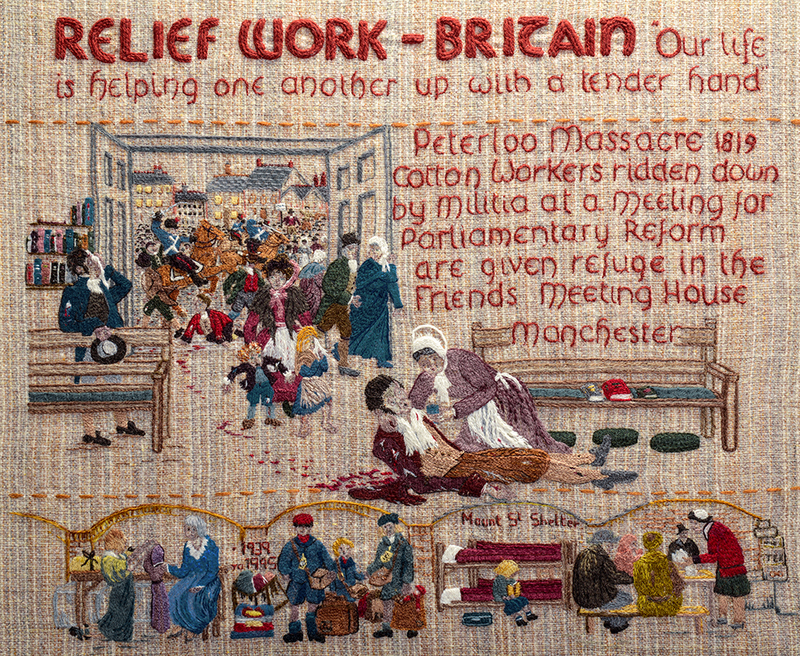 As Mike Leighs film Peterloo is released we reflect on the massacre and the Quaker Tapestry panel in which it is depicted. On the 16th of August 1819 the huge open area around what’s now St Peter’s Square, Manchester, played host to an outrage against over 60,000 peaceful pro-democracy and anti-poverty protesters; an event which became known as The Peterloo Massacre. An estimated 18 people, including four women and a child, died from sabre cuts and trampling. Nearly 700 men, women and children received extremely serious injuries. All in the name of liberty and freedom from poverty. The Massacre occurred during a period of immense political tension and mass protests. Fewer than 2% of the population had the vote. Hunger was rife with the disastrous corn laws making bread unaffordable. As with the Tiananmen Square Massacre, there were unlikely heroes among the military. An unnamed cavalry officer attempted to strike up the swords of the Yeomanry, crying – “For shame, gentlemen: what are you about? The people cannot get away!” But the majority joined in with the attack. By 2pm the carnage was over, and the field left full of abandoned banners and dead bodies. Journalists present at the event were arrested, others who went on to report the event were subsequently jailed. The businessman John Edward Taylor went on to help set up the Guardian newspaper as a reaction to what he’d seen. The Friends’ Meeting House nearby provided a refuge for the injured and those fleeing from the cavalry. The wooden floor was soaked with the blood of the injured and dying and could not be washed away. 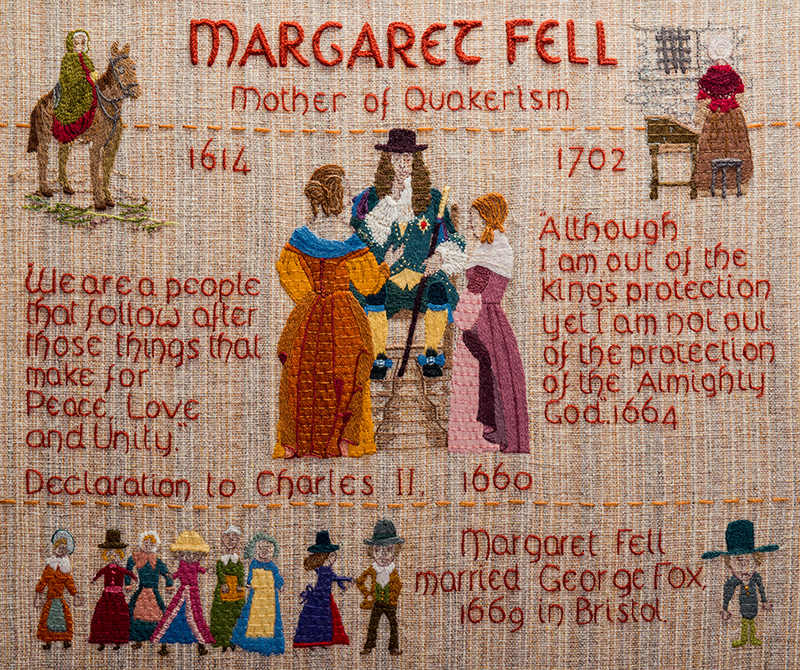 Quaker Tapestry panel ‘Relief Work’ shows a Quaker response to needs at home, often spontaneous and immediate. The Peterloo Massacre is the main picture. 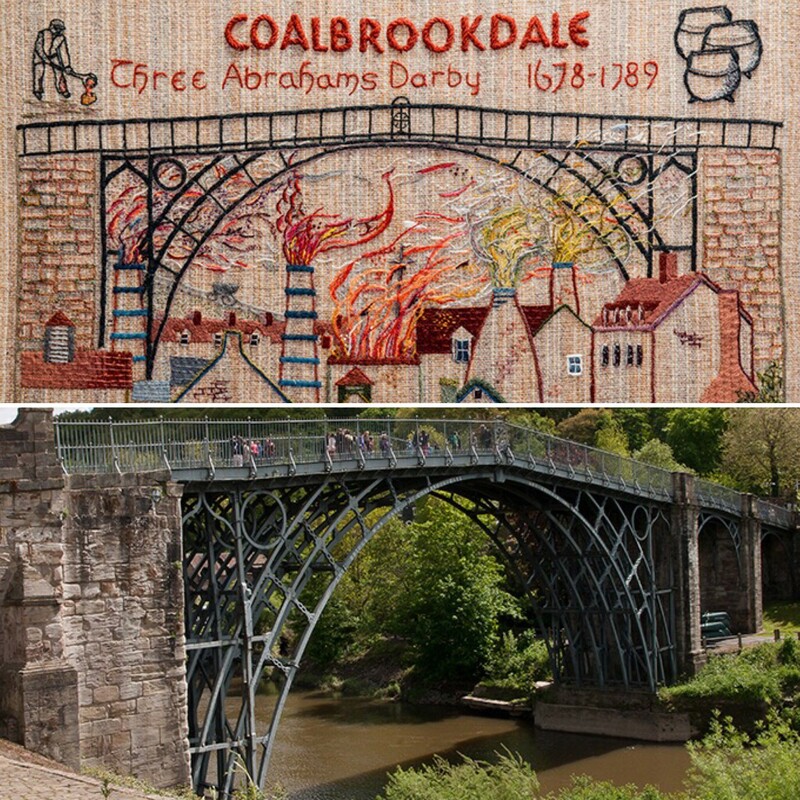 The embroidered panel looks out through the door to the scene of carnage in the square. The panel is currently on display in our museum in Kendal.